Time series are all around us, from server logs to high-frequency financial data. 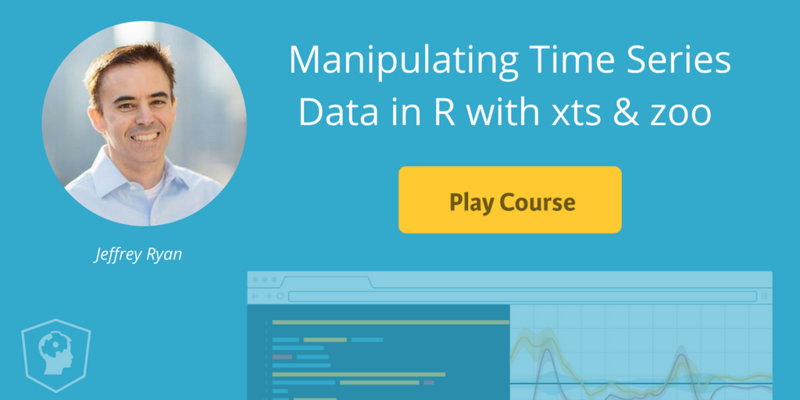 Learn all about our newest course, where xts and time series data in R are the main topic! Our new Manipulating Time Series Data in R with xts & zoo course is here! Learn from the creator of xts and quantmod, as well as a multitude of other packages for R and finance. Master time series data manipulation today! Manipulating Time Series Data in R with xts & zoo features 56 interactive exercises that combine high-quality video, in-browser coding, and gamification to make your learning experience more enjoyable. Jeffrey Ryan will teach you the fundamentals of time series data manipulation with the xts and zoo package. In the first chapter, you will be introduced to the basic objects in xts and zoo and their components, and see examples of how to construct and examine the data. The next chapter will cover the basics of one of the most useful features of xts: time-based subsetting. From there you'll explore additional ways to extract data using time phrases, and conclude with how to do basic operations like adding and subtracting of your xts objects. In the third chapter, you will learn how xts handles merging new columns and rows into existing data, how to deal with the inevitable missing observations in time series, and how to shift your series in time. The fourth chapter will teach you how to calculate values for disjoint periods of time or aggregate values from a higher frequency to a lower frequency. Lastly, in the fifth chapter, you will use the internals of the index to find repeating intervals, see how xts provides intuitive time zone support, and experiment with ways to explore your data by time - including identifying frequency and coverage in time! Ready to get started? !